Another year, another SuperComputing. Yes this year EGEE have again got some booth space at the premier international computing event SuperComputing. This year it is in the chilly and ever so slightly damp Portland, Oregon. Outside the climate the city has been a great host so far. The conference centre is another mammoth building and is packed with the most cutting edge technology I think I have ever seen. People giving away Kindle's, iPods, sun glasses and of course more pens than you can shake a stick at. I'm here with EGEE and we are sharing our space with EGI just promoting the science and work that has gone on for the last 5 and a half years and will continue beyond the end of EGEE. It has been a busy week though, from poster tubes going AWOL and parcels being mis-delivered I have spent a good bit of time chasing people. Once we had that sorted however it has run smoothly, lots of visitors and interest in the grid and the science. As I said Portland has been a great host. I've been to an ice hockey game (Portland Winterhawks Vs Chilliwack Bruins, home team lost 5-4), saw Kiss (I have never laughed so hard at a concert, I don't think they were intentionally funny though) and off to see the Portland Trailblazers play the Detroit Pistons tonight with a few of the others. 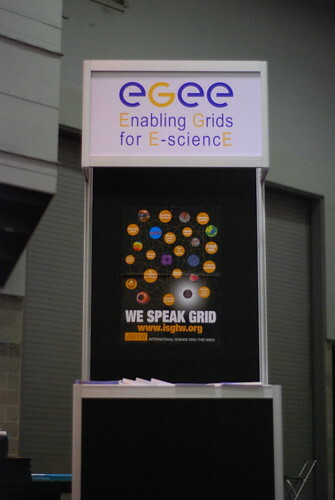 You can see some images of the EGEE stand here. Looks very cool. Good luck in scoring a Kindle!